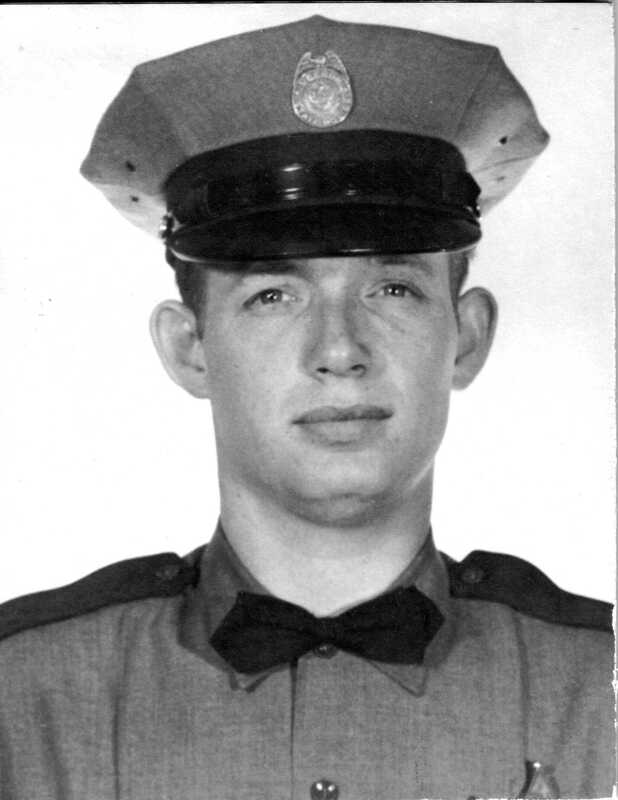 Oregon State Trooper, Ralph D. Bates, had celebrated his 24th birthday just over a month before the evening of Thursday, November 8, 1963. He had joined the Oregon State Police just over six months before on May 1, 1963 and was assigned to patrol duty out of the Arlington Office. Shortly before 7 PM on the 8th Trooper Bates pulled over an automobile on Highway 30 and when he approached the driver pulled a gun and fired on the officer hitting him in the chest. A motorist passing by found Trooper Bates lying on the pavement next to his patrol car. The motorist called in the incident on the patrol car's radio. Investigators discovered that Bates had written down the license plate number of the automobile and officers throughout the region were put on the alert. About 3 ½ hours later two officers pulled over the suspect's car near Condon. When they approached the car Edward W. Sheckler, the 27 year-old driver, went for a 22 caliber weapon on the seat next to him. He did not fire on the officers and was taken into custody and lodged in the Gilliam County jail in Condon. According to the Pendleton East Oregonian Sheckler was a former mental patient at the Salem and Pendleton mental hospitals. The gun was a .22 caliber rifle that had been sawed off to about 8 inches. Sheckler was later committed to the State Mental Hospital and died there May 2, 1964. Trooper Ralph Bates was born in Long Beach, California to Albert B. and Peggy M. Bates on September 26, 1938. He graduated from Medford High school in 1956 and served in the United States Navy from 1956 to 1959. He worked in a lumber mill in Medford before joining the Oregon State Police. Trooper Bates was not married. In addition to his parents, he had two brothers and a sister and several nieces and nephews who survived him. Six members of the Oregon State Police were the casket bearers at his funeral. He is buried at Hillcrest Memorial Park in Medford.